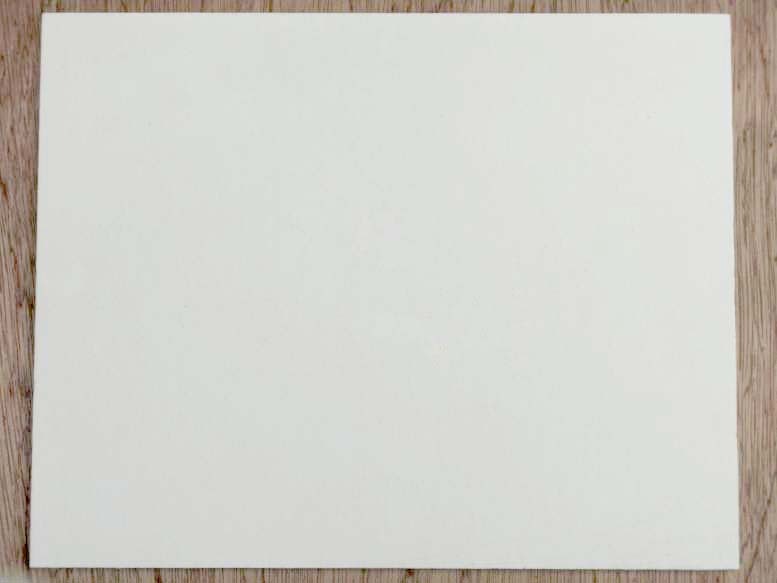 A few days ago I was scanning the internet looking for raw art supply materials, and I came across a site that sold a gesso mix using methyl cellulose. 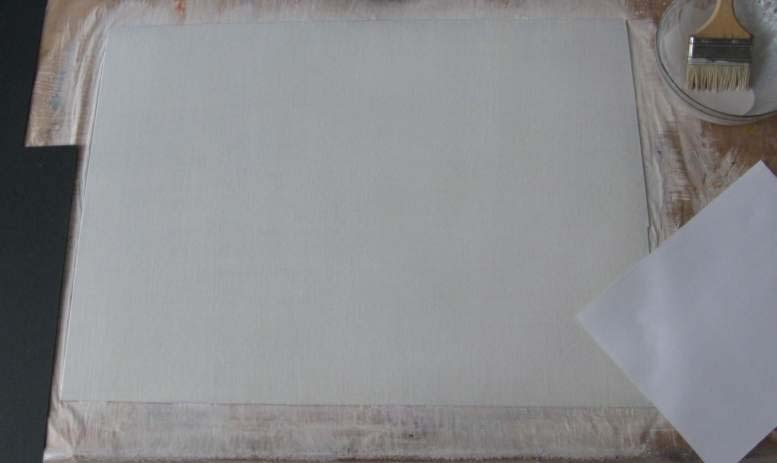 This was “Eco Gesso” sold by Natural Earth Paint. I was surprised, but intrigued. I’ve used methyl cellulose (MC) and Carboxymethyl cellulose (CMC) as art mediums before, but not in this manner. (Here’s a link to a previous post using MC mixed with oils.) 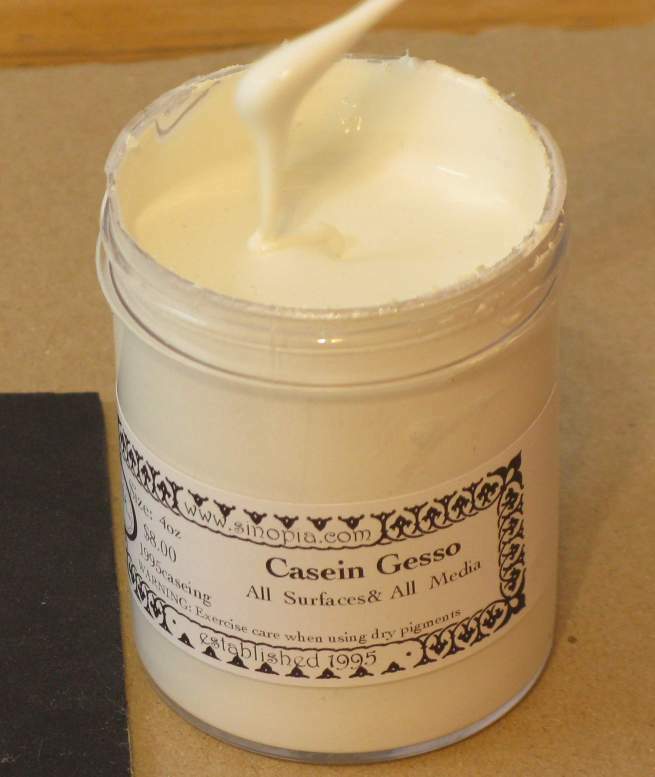 I’ve made gesso before using rabbit skin glue (RSG) or casein for many years. My first reaction to one of this type was that MC or CMC would be too weak by comparison to serve as an effective foundation for painting; however, being naturally curious, I decided to try to make some of my own, and test it out. A $30 kit from Natural Earth sounded like too much to pay for experimenting. 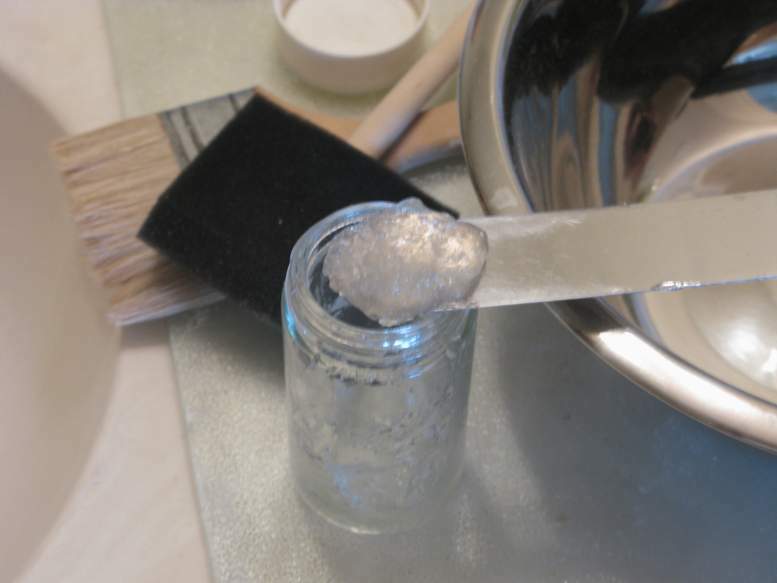 I’ve read that CMC has a stronger bond than MC, so I took a teaspoon of CMC powder, and converted it into a gel by adding eight teaspoons of distilled water. Next I added water to thin this out, and solids to make the gesso. That’s the gesso in the metal bowl. I took a scrap panel I had, 8 x 10 inches, patched it up a bit, and applied the first thin coat. Here’s the finished panel with 8 coats. I had to make 3 different attempts at this. 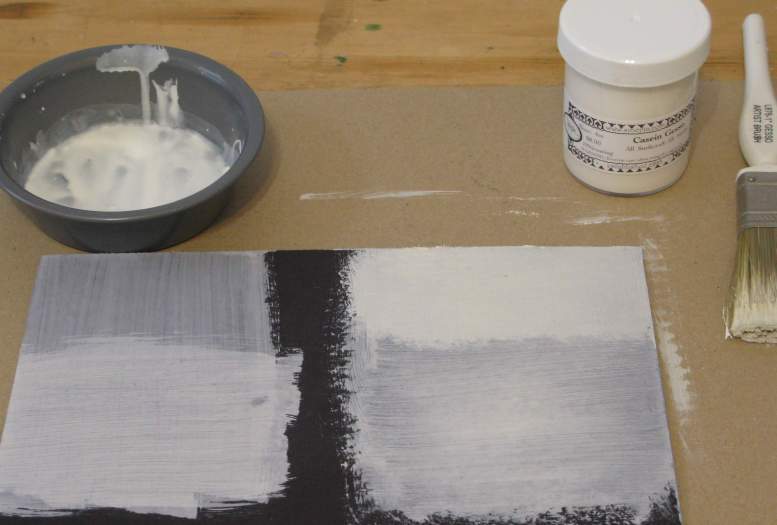 The first batch of gesso I made, using the same ratios of CMC gel that I use with either RSG or casein was too thick, and the end result on the dry panel was dusting off too much, leading me to believe the glue was too weak to hold that much gypsum. This panel is the second attempt, which had 25% less solids, but the same glue strength. It went down very smoothly, and although it didn’t powder off as badly as the first one, it still was rather weak. I could wipe the surface and get a powdery residue. I made a third attempt by using less water in the glue, and it didn’t brush on as smoothly, but still dusted off. 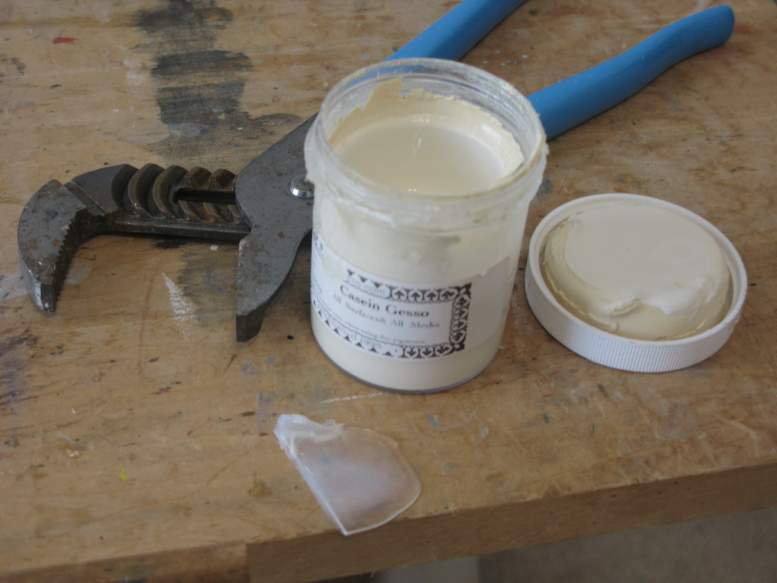 In summary, this gesso is much weaker than those made using RSG or casein, just as I first suspected. However, it’s not completely unusable. It’s like painting a fresco. 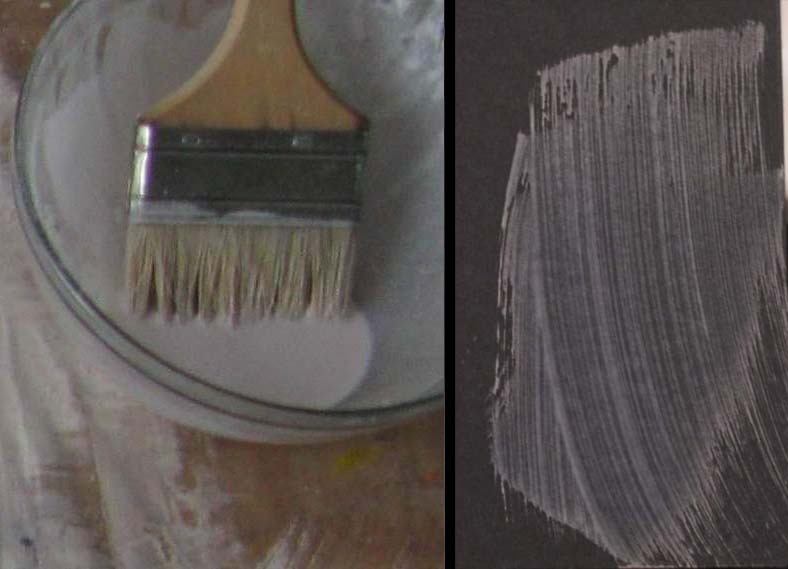 Wet paint will turn pastel from mixing with the surface powder, but still hold. 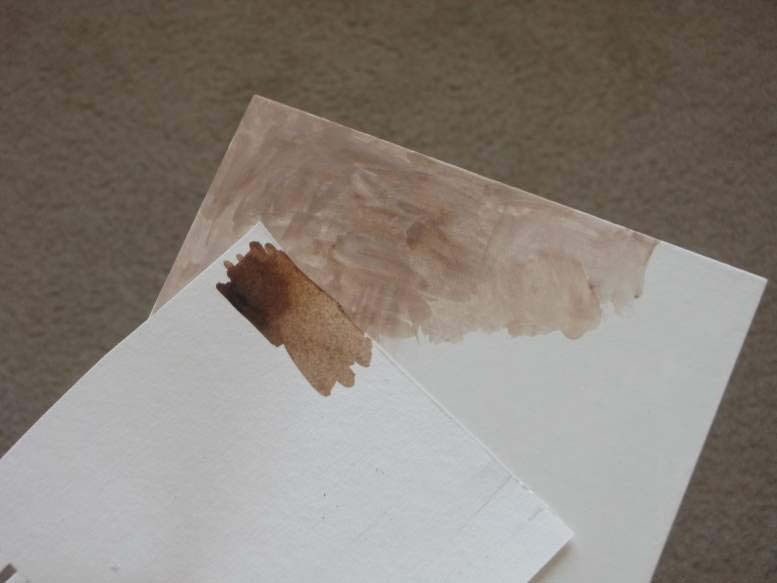 You can see the difference of this burnt umber paint on the CMC gesso panel compared to the same paint on a scrap piece of watercolor paper. If one doesn’t mind that desaturation of color, then it can work acceptably with either water based or oil based paints. The CMC powder can be found online very easily. I bought mine at a local ceramic supply store. It doesn’t have to be heated or refrigerated like the other glues, but can grow mold. A drop of preservative, like thymol, will prevent that. Personally, I’ll stick to the other glues. They make a stronger surface and are more versatile, but it’s good to know there’s an alternative. I still need to smooth out and clean up some places, but it’s mostly finished. Although, you can lighten the drawing with an eraser on this gesso surface, you can’t really erase without smudging the graphite. However, it is possible to lightly scrape off the marks with a sharp knife or razor blade. 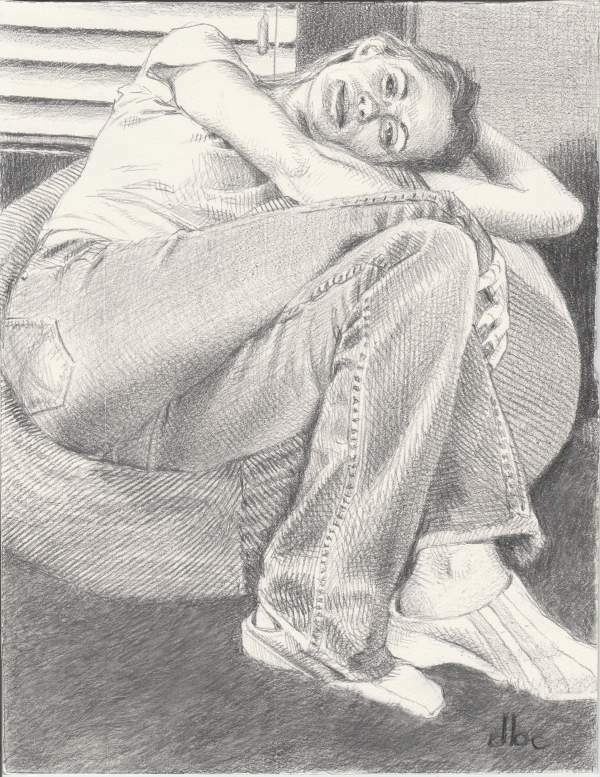 This is a new drawing I started of my friend sitting on her bean bag chair. 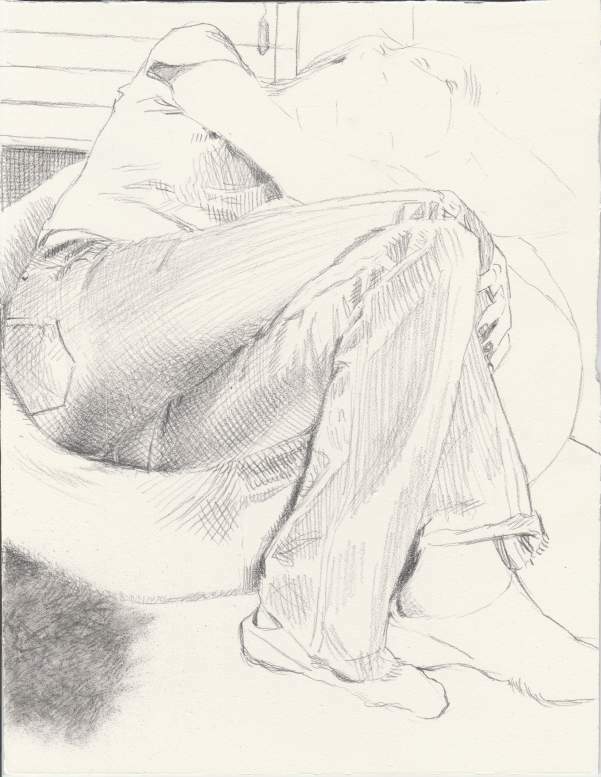 The surface is a small gesso panel, 8.5 x 11″, and I’m drawing with graphite. She had this fuzzy shag carpeting on the floor, so to capture that I decided to brush on some graphite powder with a stiff brush. A few days ago I popped over to Sinopia’s website to see what’s new. They’ve long been highly regarded as an excellent supplier of raw pigment and paint making supplies. Among this is material for making casein paint and gesso grounds. 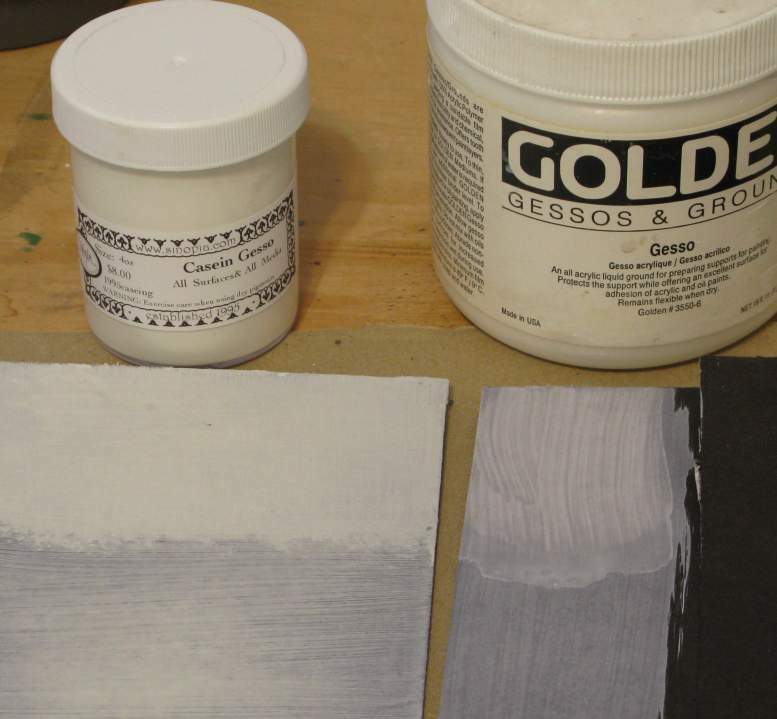 Gesso, as you may know from some previous posts of mine, is a paint ground made traditionally with rabbit skin glue or casein, and different types of plaster solids. 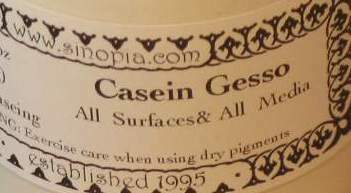 What was new to me is they now offer a casein based gesso that you can buy ready-made. No mixing of materials, just open the can and paint it on. I ordered a small jar of it that arrived this afternoon. As I waited for the order to arrive, I fired off a few questions to Sinopia that they responded to quickly. 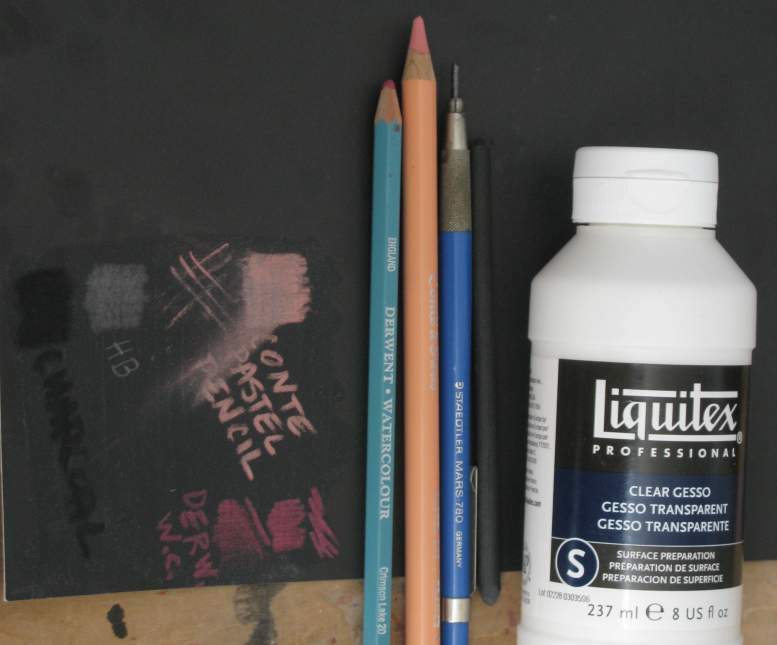 If I use this on paper, since it contains oil, should I first add sizing to the paper before applying the gesso? Should it only be used on firm supports? Can it be used on stretched canvas as well as wood panels? It is very thick, more so than I expected. Thicker than acrylic primers I have used, but about the same as oil primers. It can be brushed on right out of the jar, but you’ll need a good thick brush. However, it can certainly be thinned with water. If you thin it and use it as an oil paint surface, I would recommend sizing the surface first. In the picture above I show on the left a thinned mixture (about 30% water) on a black sheet of mat board. On the right side of the board I painted 2 coats right out of the jar. I painted the 2nd coat (not thinned) after about 15 minutes, and it took about 30 minutes or so for that to dry to the touch. A hair drier can speed up the evaporation of the water content. In this picture I’m comparing the 2 coats of gesso to Golden’s acrylic primer. The primer is much thinner, and 2 coats of it are not as bright as 2 coats of gesso. 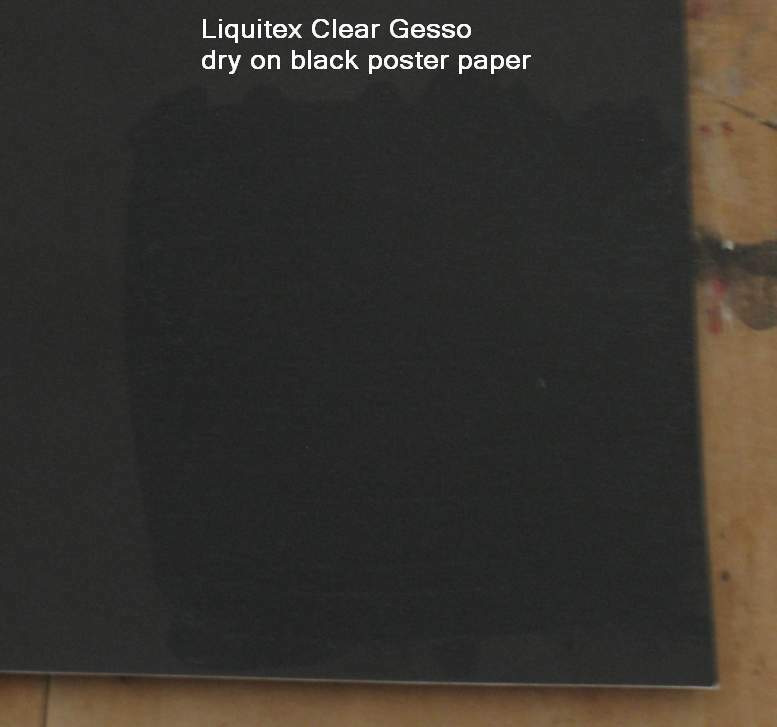 The gesso covers quite well, even on this dark black paper. There was no information about how long to wait before I start painting on this surface. In my initial test, I waited 2 hours after applying the 2nd coat, and tested casein, oil, and gouache paint. I used the paint right out of the tube, and thinned with water or turpentine for the oil. I saw no problem with adhesion, or more importantly no reaction with the ground lifting into the paint. I even washed the surface with a brush loaded with water, dabbed it with a paper towel, and none of the white was released. Regarding oils, it is recommended by Golden when using their acrylic primer that has been thinned with water, you should wait several days for all the water to evaporate before applying any oil paint to the primer surface. In this case, I would advise the same with the casein gesso, since there is some water already inside it. In Sinopia’s description on the website they say this has “all the same qualities” of rabbit skin glue gesso. I would say it has some, but it doesn’t feel the same. I’ve made many gesso panels using RSG or casein (without using an oil emulsion,) and I can say that this surface feels different. Traditional gesso feels like a slab of cold stone. This reminds me more of an oil primed surface. It is a water and oil emulsion, after all. I like that feel, but it’s not like traditional gesso to me. The big difference with an oil primed surface and this, of course, is you can’t use any water media on top of an oil primer. Also, an oil primer takes a long time to cure, but this does not. 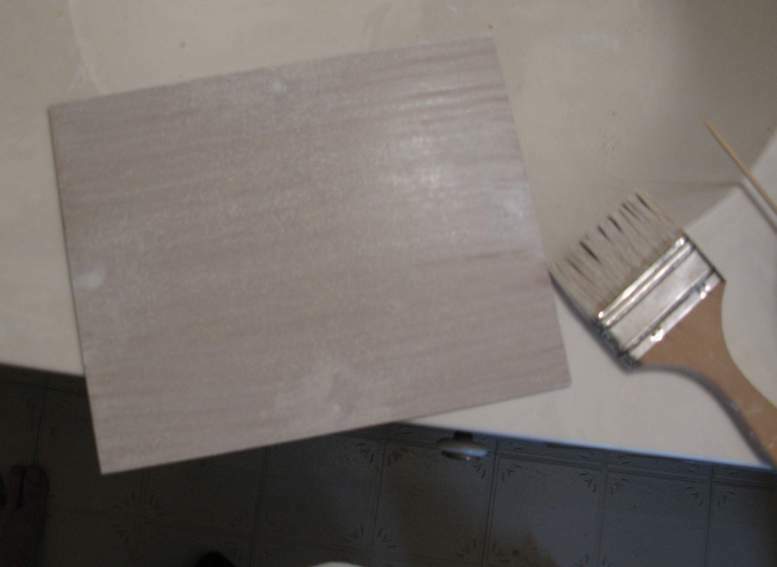 Comparing this to a traditional gesso ground, despite the different feel, this has many similarities and some benefits. RSG requires much more preparation time, and has to be held at a warm temperature while using. Once it’s made it has a shelf life of only a few days at the most. Casein gesso that I’ve made (not using emulsified oil) can last up to 4 to 6 months in refrigeration, and then starts to break down and become useless. According to Sinopia, this product can be stored indefinitely. No refrigeration is required. 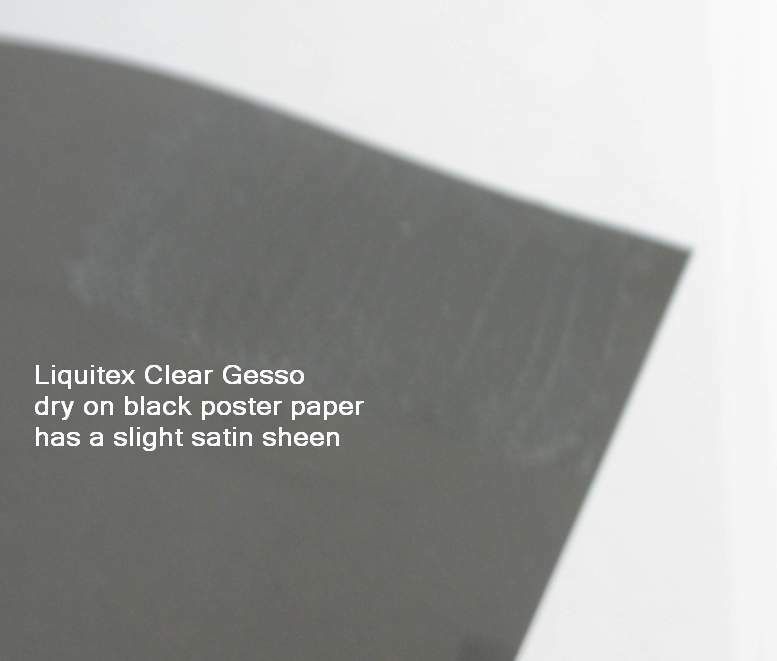 It’s equally as versatile as traditional gesso for use with all media, but according to Sinopia can be used on flexible surfaces like a stretched canvas, which is not true of traditional gesso. The biggest problem I’ve had with acrylic primed surfaces is they destroy brushes. The solids in them will wear down an expensive brush in no time at all. Time will tell if this casein gesso will have the same problem. I suspect not. 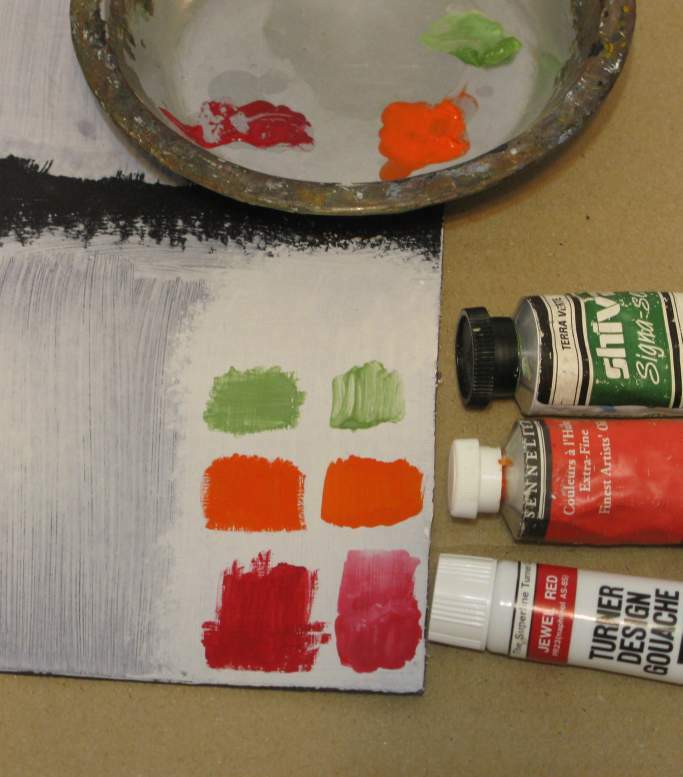 There are some acrylic primers that will work with watercolor or gouache, like Fredrix’s Watercolor Canvas, or Ampersand’s Aquabord, but the surface has to be made porous so they’re even rougher for brushes. Also, if you apply those primers yourself, like Golden’s Absorbent Ground, they are supposed to be applied on top of a standard acrylic ground, so you have to have both types. This casein gesso doesn’t have those problems. It appears to me at this point to be more versatile, potentially more so than any other ground on the market! I’ve only had this for a day, so much more testing is required. My first impression is very positive. I wanted to see if I could use an acrylic medium to approximate the same quality of surface I get using animal protein (hide glue or casein) for my binder when making gesso. This will not be the same result as the commercial brands of acrylic gesso you see on the market. That’s more like paint. The goal of this is to keep it very thin, and sand it to give me a surface that’s smooth as marble. My choice for acrylic polymer medium for this experiment was Golden’s GAC 800 medium. The description of it being “useful as a modifier when adhesion to chalky surfaces is desired” sounded good for this application. 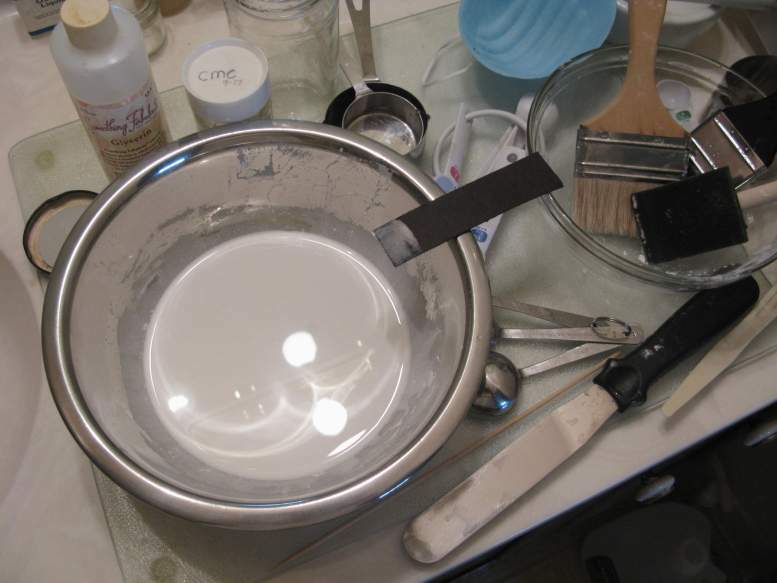 The solids I’m using are the same as what I use for traditional gesso: calcium carbonate. I sometimes also add titanium white pigment, but not this time. I wanted something more grey. The surface I’m applying it to is a medium thickness black mat board. The black will help me evaluate the coverage better, and again I’m trying for a grey undertone for the artwork I’m planning. I normally use a wood panel for my gesso, but I wanted to see if the acrylic would allow me to work on something a bit more flexible. The mat sheet is in the center (approximately 18 x 24″) with 12 coats of my acrylic gesso mixture applied. I coated the back of the sheet with a couple coats of thinned medium (no solids) to keep it from warping. The amount of medium is roughly 10% by volume, but I haven’t been doing any careful measuring – just going by sight. In the end, I wanted something very thin, like a watercolor wash, or onion soup, so it has quite a lot of water. There’s a piece of the original black mat board on the far left. I placed a sheet of white copy paper on the right to show the contrast. This bowl shows a small amount of the gesso left over, and helps show how thin it is. I applied a single coat on that black sample to the right. It dries relatively quickly – about 15 minutes to the touch, and the texture feels the same as the traditional gesso I make. So far so good. I’m going to let it continue to air dry for a couple days, and then see how well I can sand it smooth.